In today's economy, budgets for data security can be scarce. In most companies, security is considered to be a cost center into which you can pour a lot of money yet still be considered "insecure". However, security and privacy techniques can be turned around to show businesses how much money is being saved by avoiding breaches or incidents, improving workersâ productivity and potentially avoiding lawsuits. 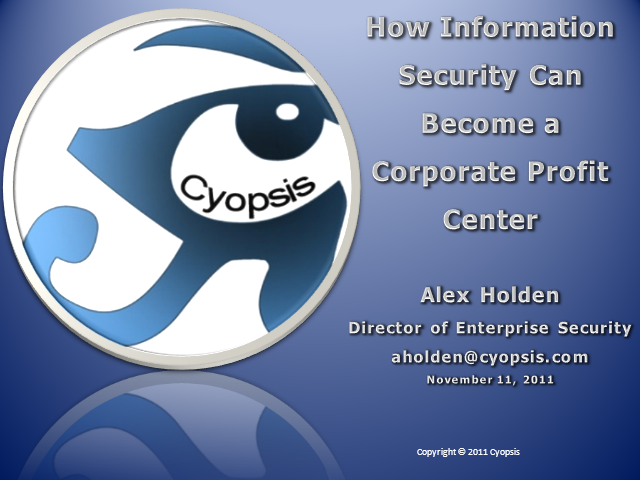 In this presentation, Alex Holden, Director of Enterprise Security at Cyopsis, will discuss innovative ways to leverage security and privacy to show businesses return on their investments and justify additional necessary security expenditures.